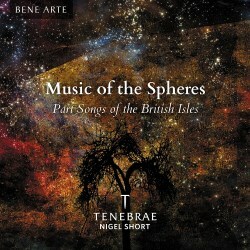 Elsewhere in these pages, I've waxed lyrical, and at great length, about how much I'm impressed by Nigel Short and Tenebrae, for their choices of programmes as well as for their musical brilliance. At the risk of repeating myself, I found this disc utterly enchanting and, so long as you're not completely allergic to English Part Songs, I think you will too. This choir's great strength is their utterly unimpeachable blend, their clear intonation and their unflinchingly musical approach to their texts. Those qualities are all on display at their very finest here, with a richly rounded sound that you'll struggle to hear bettered elsewhere, helped by a glorious recording in the acoustic of All Hallows Church, which fits them like a glove. The repertoire itself was almost all new to me, but it's full of the most marvellous discoveries. Indeed, Short himself writes in the programme notes that he was, himself, pleasantly surprised by the wealth of new discoveries he made in planning the programme, meaning that many of his well-established favourites had to be set aside in the face of the new things that came his way. Herbert Murill, who is better known for his church music, kicks the disc off with a delightfully upbeat setting of O Mistress Mine, and a languid, intoxicating Come Away, Death whose daring harmonies and widely-spread chords are very fitting for the mood of the words. Frank Bridge's settings are all completely top notch. Autumn manages to balance austerity with beauty, while The Bee is quietly humorous. Music, when Soft Voices Die, however, is just marvellous, suffused with a beautifully rich sense of longing which both enervates and fulfils the sense of the text. Vaughan Williams' Shakespeare Songs work brilliantly, especially Full Fathom Five, whose texture is marvellously multi-layered, the composer using his singers like an orchestra and the choir responding brilliantly to the challenge as bell-like singing bounces off the melody in the upper voices. The Elgar selection is more rich and more luxuriant. Tennyson's There is Sweet Music provides the composer with ample opportunities to experiment with hanging suspensions and unexpected harmonies, and there is a twilit, occluded air to the music of Deep in my Soul that fits the mood of Byron's poem perfectly, and after this, O Wild West Wind rings out clearly and brightly. There is no Edwardian homeliness to Owls, however; the music set to Elgar's own mysterious text, challenging the Elgarian stereotype with its daring unresolved harmonies and chord progressions that defy explanation. Ernest Walker is a new name to me, but his setting of Herrick's two-line Soft Music is a sensual treat. Judith Bingham's The Drowned Lovers, again to her own text, is spellbinding; both beautiful and deeply tragic, the soloist telling the macabre story while the rest of the choir creates undulating dark harmonies around them, perhaps to evoke the encroaching darkness of the waters of the lake. It was written to segue seamlessly into Stanford's Blue Bird, which makes a wonderful companion piece. Milton's On Time takes the listener on a journey of adventurous scope that you might not expect from Stanford, full of exploratory harmonies and challenging paths that you seldom find in his better known church music. Harvey's Song of June is intoxicating, both in its harmonies and in its heady setting of Wilfred Owen's brimming text, and Bob Chilcott's Modern Man is a pleasing, upbeat way to end the disc, with its appropriately pacy depiction of a runner, it's dreamy Last Invocation, and then its finish with Whitman's marvellously confident depiction of selfhood. In short, this is a delight. Whatever your musical tastes, be they indulgently conservative or moderately adventurous, you'll find something in this range of repertoire not just to enjoy but to revel in. Full texts are included, together with essays on the music.